stopped or parked vehicles • oncoming and crossing traffic As a result, DISTRONIC PLUS may neither give warnings nor intervene in such situations. • neither give a warning nor intervene • accelerate unexpectedly There is a risk of an accident. DISTRONIC PLUS cannot take into account the road, traffic and weather conditions. DISTRONIC PLUS is only an aid. You are responsible for the distance to the vehicle in front, for vehicle speed, for braking in good time and for staying in your lane. Do not use DISTRONIC PLUS: • in road and traffic conditions which do not allow you to maintain a constant speed e.g. DISTRONIC PLUS may not detect narrow vehicles driving in front, e.g. motorcycles, or vehicles driving on a different line. If DISTRONIC PLUS no longer detects a vehicle in front, DISTRONIC PLUS may unexpectedly accelerate the vehicle to the stored speed. If there is a change of drivers, advise the new driver of the speed stored. On long and steep downhill gradients, especially if the vehicle is laden or towing a trailer, you must select shift range 1, 2 or 3 in good time. By doing so, you will make use of the braking effect of the engine, This relieves the load on the brake system and prevents the brakes from overheating and wearing too quickly. 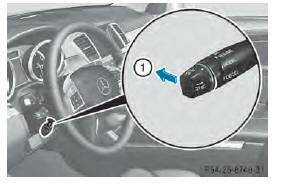 If DISTRONIC PLUS detects that there is a risk of a collision, you will be warned visually and acoustically. DISTRONIC PLUS cannot prevent a collision without your intervention. An intermittent warning tone will then sound and the distance warning lamp will light up in the instrument cluster. Brake immediately in order to increase the distance to the vehicle in front or take evasive action provided it is safe to do so. For DISTRONIC PLUS to assist you when driving, the radar sensor system must be: • activated • operational If there is no vehicle in front, DISTRONIC PLUS operates in the same way as cruise control in the speed range between 20 mph (Canada: 30 km/h) and120 mph (Canada: 200 km/h). If a vehicle is driving in front of you, it operates in the speed range between 0 mph (0 km/h) and 120 mph (Canada: 200 km/h). This device has been approved by the FCC as a "Vehicular Radar System". The radar sensor is intended for use in an automotive radar system only. Removing, tampering with, or altering the device will void any warranties, and is not permitted by the FCC. Do not tamper with, alter, or use in any non-approved way. In order to activate DISTRONIC PLUS, the following conditions must be fulfilled: • the engine must be started. It may take up to two minutes after pulling away before DISTRONIC PLUS is operational. • the electric parking brake must be released. • off-road program 2 must be deactivated (vehicles with the ON&OFFROAD package). • DSR must be deactivated. ■ Briefly pull the cruise control lever towards you 2 or press it up 1 or down 3. ■ To adjust the set speed in 1 mph increments (1 km/h increments): briefly press the cruise control lever up 1 to the pressure point for a higher speed or down 3 for a lower speed. 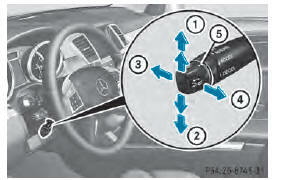 Every time the cruise control lever is pressed up or down, the last speed stored is increased or reduced. ■ To adjust the set speed in 5 mph increments (10 km/h increments): briefly press the cruise control lever up 1 past the pressure point for a higher speed or down 3 for a lower speed. ■ Remove your foot from the accelerator pedal. If the vehicle in front has been detected and is shown in the multifunction display, you can also activate DISTRONIC PLUS when driving at speeds below 20 mph (30km/h). If the vehicle in front is no longer detected and displayed, for example because it has changed lanes, DISTRONIC PLUS is deactivated. You will hear a warning tone if this is the case. ■ To adjust the set speed in 1 mph increments (1 km/h increments): briefly press the cruise control lever up : to the pressure point for a higher speed or down 3 for a lower speed. DISTRONIC PLUS can only be activated at under 20 mph (30km/h) if a vehicle in front has been detected. Therefore, the DISTRONIC PLUS distance display in the instrument cluster should be activated . ■ Briefly pull the cruise control lever towards you 1. ■ If the vehicle in front pulls away: remove your foot from the brake pedal. If DISTRONIC PLUS detects a faster-moving vehicle in front, it increases the driving speed. However, the vehicle is only accelerated up to the speed you have stored. When changing lanes, DISTRONIC PLUS monitors the left lane on left-hand drive vehicles and the right lane on right-hand drive vehicles. The current speed is maintained: • approximately 10 seconds before the traffic circle/T intersection and approximately 1.5 seconds when driving on a traffic circle. • approximately 12 seconds before reaching a highway exit and approximately 4 seconds after the highway exit. • the driver's door is open and the driver's seat belt is unfastened. 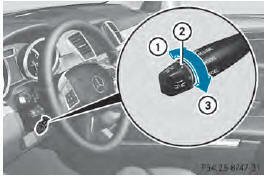 • the engine is switched off, unless it is automatically switched off by the ECO start/stop function. • a system malfunction occurs. • the power supply is not sufficient. Keep in mind that it may take a brief moment until the vehicle has accelerated or braked to the speed set. ■ Press the cruise control lever up 1 for a higher speed or down ;2 for a lower speed. ■ To adjust the set speed in 1 mph increments (1 km/h increments): briefly press the cruise control lever up 1 or down 2 to the pressure point. ■ To adjust the set speed in 5 mph increments (10 km/h increments): briefly press the cruise control lever up 1 or down 2 to the pressure point. 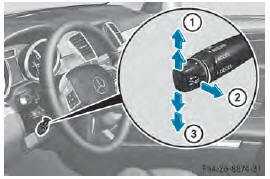 ■ To increase: turn control 2 in direction 3. ■ To decrease: turn control 2 in direction 1. ■ Briefly press the cruise control lever forwards 1. ■ Brake, unless the vehicle is stationary. ■ Select the Distance display function using the on-board computer . In the Assistance menu of the on-board computer, you can also activate or deactivate PRE-SAFE® Brake . • vehicles traveling on a different line • other vehicles changing lanes • narrow vehicles • obstructions and stationary vehicles • crossing vehicles In such situations, brake if necessary. DISTRONIC PLUS is then deactivated.